With the Prologue Concept, Audi introduces its new design language. For an automaker that has ridden a wave of unprecedented success on the back of innovative design — definitive, clean and at times audacious — a concept vehicle that promises to usher in Audi’s new DNA is a game-changing moment. 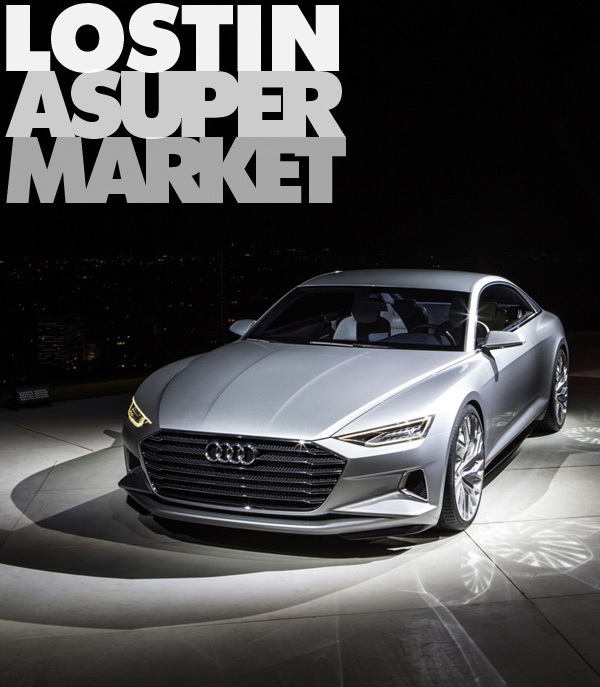 Up high in the Hollywood Hills, Audi welcomed a roomful of well-heeled tastemakers in fine tailored suits and expensive eyewear to witness the beginning of a new era for the German luxury brand. With the City Of Angels sparkling far below the extended terrace, a lone spotlight shone on a veiled vehicle, long and imposing. 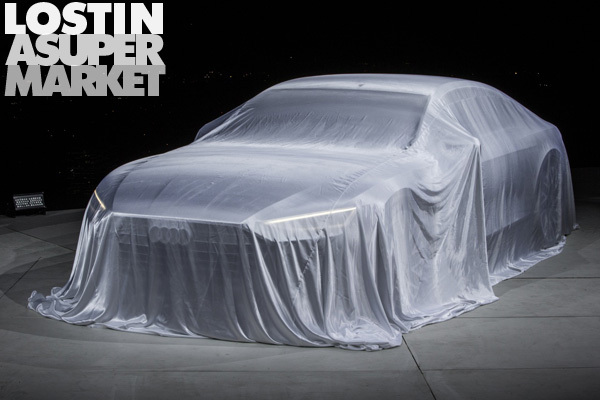 Even beneath the muted covers it was clear this was a machine of great importance — the first vehicle designed under the auspice of Audi’s new Design Chief Marc Lichte, a man who only took over the reins this past February. In that short timeframe, from a white sheet design, Lichte had penned the Future Of the Four Rings in the form of this Prologue concept, as well as the next-generation A8, A7 and A6. “This is more than a concept car, it is the beginning of a new era of design at Audi,” Lichte explained as he stood next to his creation. “The [Prologue] is the essence of the future.” He then pulled the sheet before him, dramatically revealing an expansive coupé. Long and squat, shining like a diamond in its pearl effect “light diva gray” paintjob. For a brand built on design and engineering, the aptly named Prologue offers plenty of each. Its exterior lines are sharp and angular, a motif that is repeated throughout the car — whether it’s the sharply stamped sheet metal, trapezoidal headlamps, creased aluminum hood, deli-slicer rims or diamond-patterned grille. 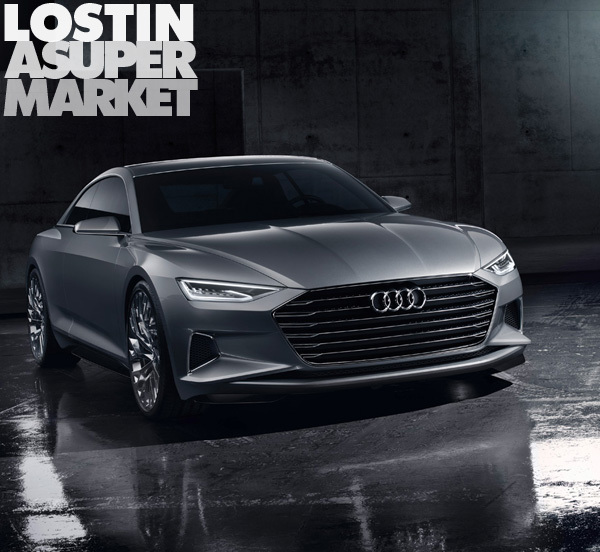 Shorter and lower than the A8 upon which it is based, the Prologue chops two doors off its sibling and adds a striking fastback profile, pulling the C pillar way to the back. The effect is somewhat like a larger A7, but more striking due to its coupé silhouette. The one feature that will instantly impose its will on you is the new Singleframe grille — now much wider, shorter and lower placed than any contemporary Audi. It is dominant, gaping, and yet still elegant in a world where ballooning grille sizes are becoming caricatures of automotive monotony. High-resolution Matrix laser headlamps define the top corners of the fascia, while sharp geometric air intakes define the lower corners. A point of emphasis of the new DNA, according to Lichte, is to embody Audi’s Quattro AWD technology — an esoteric notion manifested via flared fenders and widely positioned 22-inch wheels anchoring each corner of the vehicle. From a birds-eye view, the muscular fenders are the outermost points on the car. This lends the Prologue an extremely planted stance, while the swept fastback profile gives it an athletic motion, even while sitting static like a Richard Serra sculpture. Exterior-wise, other points of note are the handle-less doors which feature tiny, highly stylized aluminum mirrors and illuminated sensors that electromechanically let you inside. Rear LED lights run horizontally across the entire width of the trunk, as does a recessed glossy black aluminum diffuser below. But while the exterior design language was properly hyped, what Audi saved for the interior was arguably even more rewarding. Seating four adults, the layout aims to meld sportiness with long-range driving comfort, like a proper Gran Turismo should. Surfaces are swathed in a new grade of soft, natural-grain hide that Audi calls “passion” leather. Nubuck, aluminum and open-grained elm wood veneer finish it off. 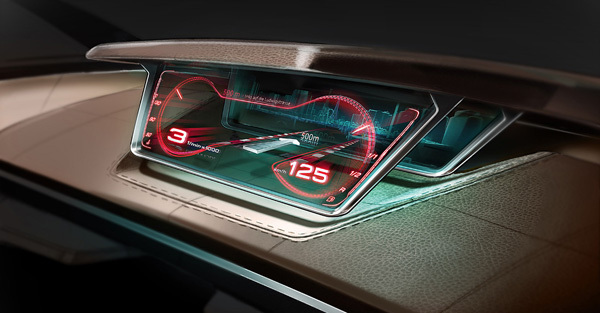 The tech aspects of what Audi dubs their “virtual cockpit future” include a 3-screen display that runs horizontally across the entire dashboard. The leftmost display lets the driver to access lighting and assistance systems, the middle screen controls media, while the right screen allows the front passenger to individually handle entertainment duties. They can even share info, so your friend sitting shotgun can find directions and swipe it over iPad-style to the your display. A separate fourth flexible OLED touchscreen rises from the center console when the Prologue is started, letting the driver input handwriting, access climate control and more. Perhaps the coolest tech innovation is dubbed the “Butler”. The Butler ID’s passengers based on their smartphones, and then adjusts seats and ambient climate according to their preset preferences. A dedicated phone box in the center console — called the Easy Slot system — charges your phone while connecting the passenger to the concept’s multiple infotainment options. Performance-wise the Prologue features Audi’s dynamic all-wheel steering, which turns the rear wheels up to five degrees. This improves the protracted vehicle’s turning ability at low speeds, and offers greater responsiveness and stability at high speeds. Adaptive air suspension, torque vectoring, and the body rigidity that comes with an aluminum and ultra-high-strength steel chassis means the ride will be compliant, agile and true. So what lies under that sharply creased hood, you may ask? How about a twin-turbocharged 4.0-liter TFSI V8. One that produces 605-horsepower and 553 lb-ft of torque, good enough to catapult the 4,365-lb coupé from 0-to-62 mph in just 3.7 seconds. The Prologue’s eight-speed tiptronic transmission is also linked to a 48-volt system that transforms the powertrain into a “mild hybrid”, one that can recover up to 12 kW of energy while braking. This helps the concept car notch 27.4 mpg — quite respectable for a two-ton luxury flagship. Luckily the Prologue also boasts massive 20-inch carbon-fiber ceramic front brakes — by far the largest on any proposed production car — to keep you from defacing any of Lichte’s hard won efforts.